For years now, I’ve heard about how much better a standing desk would be for my health. It’s just one of those changes I’ve been reticent to make, even though I know how much it would benefit me in the long run as someone who spends most of his day slumped at his desk writing. Sitting, for me, has blended together with one of those seemingly hundreds of horrifying causes of cancer. It just seemed like a liability I’d just had to come to accept, like having to hear “Hey Soul Sister” by Train every time I visit the grocery store. Humans are creatures of habit, and getting me to break my predisposition for sitting (or shopping at grocery stores with questionable music taste) would take a miracle. Little did I know that one such miracle would arrive in the form of the Aimezo Electric Standing Desk. The Aimezo’s striking simplicity was the first thing that jumped out at me when I started using it. 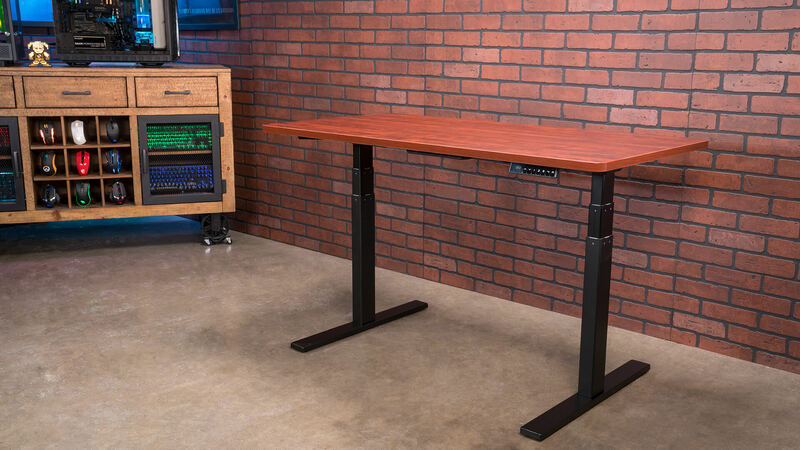 The motorized height adjustment makes raising and lowering the desk easy; you use the minimalist control panel located under the right side of the desk. The control panel contains up and down arrows, which adjust the height up or down when held down, and four preset buttons for programming your favorite heights. The small LED display on the panel shows the current height of the desk in inches. 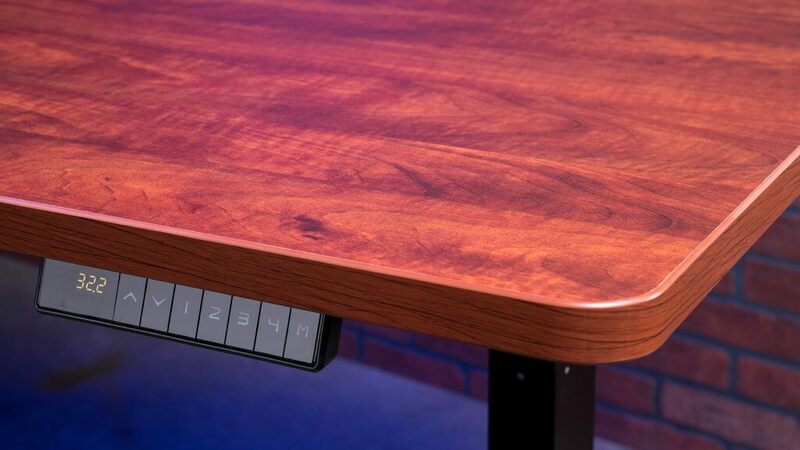 The desk motor is powered by plugging the desk into the wall. 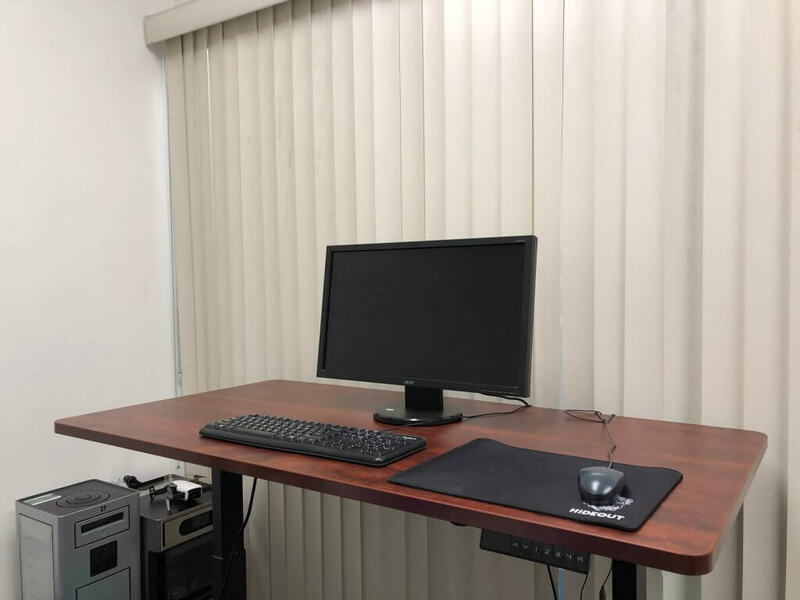 The height of the desk is variable enough that you can lower it to a comfortable sitting position too, if you want to ease into standing or just don’t want to totally ditch your cozy chair. The Aimezo doesn’t contain drawers like some other standing desk options, but some of those options also cost hundreds more, so it’s up to you to determine if the trade-off is worth it. Personally, I would opt to just purchase free-standing drawer units and place them under the desk, rather than spending more just to get one or two little drawers under the table top. The great thing about having a desk that can raise and lower to your whim is that you can potentially fit much more storage underneath than you could with a traditional desk. The actual desk’s design is simple. I reviewed the black frame model, but it is also available in grey and white, so you can choose which best fits your work space aesthetic. No matter which frame you choose, a cherry table top is included. It’s not a particularly bold design, but it’s clean and tasteful, which is sometimes all you need for your work space. I personally appreciate the fact that the Aimezo actually looks like a normal table or countertop, unlike some of the more garish standing desks that transform your work space into some facsimile of a tank. But there are more reasons to ditch your old desk than just an elegant design. Sitting has been linked to an increased risk of cancer, obesity, diabetes, cardiovascular disease and premature death. I know this is pretty grim for a tech review, but the health risks are really the primary reasons to ditch your seated desk. Standing isn’t only good for staving off disease, it can also reduce chronic pain like back pain. A study found that office workers who stood for an afternoon burned more calories than their seated counterparts, suggesting that standing at work can contribute to preventing weight gain and obesity. That same study showed that standing reduces blood sugar levels after a meal much faster than sitting, making you more awake and alert than you would be seated. Some people are ready to make the change for their health, but worry about the pain that may arise from adjusting to the extra pressure on their feet and legs. Harvard Medical School recommends easing into using a standing desk, starting by standing thirty to sixty minutes a day and gradually increasing over time. This way, you can stave off the potential leg, foot, and back pain that may arise from sudden changes in the time you spend standing. To be totally honest, I initially turned down the offer to replace my current desk with a standing one. I knew it was better for me, but I didn’t like the options I had come across in the past. Also, having worked retail for years in the past, where I was on my feet for more than eight hours a day, I’ve been perfectly comfortable sitting at a desk for a change. My attitude shifted when I actually went about using the Aimezo standing desk. I don’t know if it was the placebo effect, but I felt like it was far easier for me to stay on-task while using the standing desk. Studies have, in fact, linked use of standing desks with increased short-term task engagement, so I’m inclined to credit the Aimezo for helping me get this review finished. I certainly felt more awake and alert, and my creativity seemed to flow much better than when I’m just sitting. Again, this is my subjective experience and isn’t meant to be taken as any sort of concrete proof of additional standing desk benefits, but I can say that the Aimezo worked wonders for me. I appreciated how easy it was to operate the dual-motor height adjustment system. All the buttons are responsive, and the screen quickly refreshes to display the current height as you make your adjustments. Needing to hold the buttons in for a second or two makes it so that inadvertently bumping the buttons doesn’t make your desk lurch up and down as you try to work. The control panel is slightly recessed beneath the table top, so I never hit any of the buttons when leaning on the desk either. The simplicity of the Aimezo woke me up to the fact that switching to a standing desk wouldn’t be the pain like I thought it would. I know gaming is big for a lot of you out there, and if you’re like me, you’re probably spending hours a day seated at your PC playing without much in the way of physical activity to break it up. And no, all that fist pumping or controller throwing doesn’t count for much in the way of “physical activity”, sorry. The health benefits of minimizing your seated time applies just as much to gaming enthusiasts as it does to office workers. Death from sitting-related health conditions has sadly hit the gaming community; in one tragic instance, a British man died from thrombosis, a cardiovascular condition resulting from spending too many hours sitting with minimal movement. If your health isn’t reason enough to move your gaming rig to a standing desk, maybe better performance is. While there doesn’t seem to currently be an research that measures the direct relation between standing and gaming performance, the benefits to concentration and alertness are abundantly clear, almost certainly heightening gaming performance. At the very least, anecdotally, I can say that back in my day as a youngster, there were entire spaces dedicated to people standing and playing games; they were called arcades. For the younger readers, just picture a Dave & Busters that smells bad and instead of unattended children it’s filled with high school goths. Anyway, old folks like myself spent long hours standing and playing rounds of Street Fighter II at these places, and we did pretty well for ourselves. If anything, standing used to be the norm for gaming; it can’t hurt to try and bring it back. My favorite products to review are the ones that change my entire perception of a product category, and that’s what Aimezo pulled off with their standing desk. Over the course of my testing, I’ve totally come around to the idea of ditching my desk. 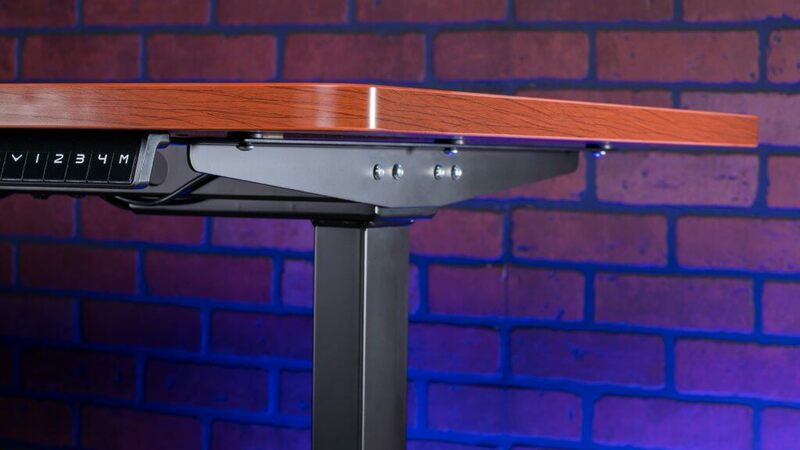 Maybe a standing desk will even give me extra focus to churn out awesome Newegg Insider content for you now more than ever! Now if only I could find something to drown out the sound of “HEEEEEEEY, HE-E-E-E-EY!” the next time I’m on a grocery run. The Aimezo is the latest electric standing desk to arrive at our offices, in a wave of more ergonomically-friendly office furniture. For those looking for a healthier work/life interaction, standing desks have become popular options.